American manned spacecraft. Study 1959. Proposed derivatives of the basic one-crew Mercury capsule for investigation of earth orbit rendezvous, lifting re-entry and land landing. Two-crew derivatives of Mercury, originally designated Mercury Mark II, are covered under 'Gemini'. Family: Manned spacecraft, USA - Space Stations. People: McDonnell. Country: USA. Launch Vehicles: Titan, Titan II. Bibliography: 483. 1959 June 4 - . Mercury follow-on program using maneuverable Mercury capsules. - . Nation: USA. Related Persons: Gilruth. Spacecraft Bus: Mercury. Spacecraft: Mercury Mark I. At a staff meeting, Space Task Group Director Robert R. Gilruth suggested studying a Mercury follow-on program using maneuverable Mercury capsules for land landings in predetermined areas. .
1959 September 1 - . 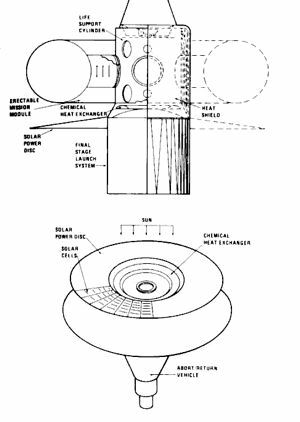 McDonnell report on a modified Mercury capsule to explore problems of space flight. - . Nation: USA. Spacecraft Bus: Mercury. Spacecraft: Mercury Mark I.
McDonnell Aircraft Corporation, St. Louis, Missouri, issued a report on the company's studies using a modified Mercury capsule to explore some problems of space flight beyond the initial manned exploration of space through Mercury. The 300-page report discussed six follow-on experiments: touchdown control, maneuver in orbit, self-contained guidance, 14-day mission, manned reconnaissance, and lunar-orbit reentry. These were more in the nature of technically supported suggestions than firm proposals, but all six experiments could be conducted with practical modifications of Mercury capsules. 1959 September 28 - . 1960 January 7 - . Future wind tunnel test needs for advanced Mercury projects. - . Nation: USA. Related Persons: Johnson, Caldwell. Spacecraft Bus: Mercury. Spacecraft: Mercury Mark I. Representatives of Engineering and Contracts Division and Flight Systems Division (FSD) met to discuss future wind tunnel test needs for advanced Mercury projects. After Alan B. Kehlet remarked on available test facilities, Caldwell C. Johnson and H. Kurt Strass presented their ideas on advanced configurations. Johnson had been working on modifications to the existing Mercury configuration, chiefly in the areas of afterbody, landing system (rotors to control impact point), and retro-escape system, rather than on advanced configuration concepts. Strass suggested that advanced work be classed as either (1) modifications refining the design of the present Mercury or (2) new concepts in configuration design, and others present agreed. Johnson consented to design models for both program categories. FSD's Aerodynamics Section would arrange for and perform tests necessary to evaluate both modifications and advanced proposals. Strass also suggested another modification, a larger heatshield diameter allowing for half-ringed flaps which could be extended from the portion of the afterbody near the heatshield to provide some subsonic lifting capabilities. Strass stated the need for aerodynamic information on an advanced Mercury configuration under consideration by his group, and on the lenticular vehicle proposed by Aerodynamics Section. 1960 April 5 - . Modification of Mercury spacecraft for a controlled reentry begun. - . Nation: USA. Spacecraft: Gemini, Mercury Mark I. The Space Task Group notified the Ames Research Center that preliminary planning for the modification of the Mercury spacecraft to accomplish controlled reentry had begun, and Ames was invited to participate in the study. Preliminary specifications for the modified spacecraft were to be ready by the end of the month. This program was later termed Mercury Mark II and eventually Project Gemini. Mercury capsule with a reentry control navigation system. - . Nation: USA. Spacecraft Bus: Mercury. Spacecraft: Mercury Mark I. Preliminary specifications to modify the Mercury capsule by adding a reentry control navigation system. Preliminary specifications were issued by Space Task Group (STG) to modify the Mercury capsule by adding a reentry control navigation system. The modified capsule would obtain a small lifting capability (lift-over-drag ratio would equal approximately 0.26). The self-contained capsule navigation system would consist of a stable platform, a digital computer, a possible star tracker, and the necessary associated electronic equipment. Dispersion from the predicted impact point would be less than 10 miles. The prospective development called for a prototype to be delivered to NASA for testing in February 1961; and first qualified system, or Modification I, to be delivered by August 1961; and the final qualified system, or Modification II, to be delivered by January 1962. STG anticipated that four navigational systems (not including prototype or qualification units) would be required. Space Task Group (STG) issued a set of guidelines for advanced manned space flight programs. - . Nation: USA. Spacecraft: Gemini, Mercury Mark I. The document comprised five papers presented by STG personnel at a series of meetings with personnel from NASA Headquarters and various NASA field installations during April and May. Primary focus was a manned circumlunar mission, or lunar reconnaissance, but in his summary, Charles J. Donlan, Associate Director (Development), described an intermediate program that might fit into the period between the phasing out of Mercury and the beginning of flight tests of the multimanned vehicle. During this time, 'it is attractive to consider the possibility of a flight-test program involving the reentry unit of the multimanned vehicle which at times we have thought of as a lifting Mercury.' What form such a vehicle might take was uncertain, but it would clearly be a major undertaking; much more information was needed before a decision could be made. To investigate some of the problems of a reentry vehicle with a lift-over-drag ratio other than zero, STG had proposed wind tunnel studies of static and dynamic stability, pressure, and heat transfer at Langley, Arnold Engineering Development Center, and Ames facilities. 1960 August 24 - . McDonnell proposed a one-man space station. - . Nation: USA. Spacecraft Bus: Mercury. Spacecraft: Mercury Mark I.
McDonnell one-man space station: Mercury capsule and a cylindrical space laboratory. - . Nation: USA. Spacecraft Bus: Mercury. Spacecraft: Mercury Mark I. 1961 April 14 - . Improved Mercury spacecraft. - . Nation: USA. Spacecraft Bus: Mercury. Spacecraft: Mercury Mark I.
NASA issued study contract NAS 9-119 to McDonnell for improvement of the Mercury spacecraft. McDonnell formed a small project group for the study, which immediately began looking to Mercury spacecraft component improvement, with accessibility as the guideline. Mercury had been a first step, almost an experiment, while the improved Mercury was to be an operational vehicle. One result of this line of thought was a basic change in equipment location, from inside the pressure vessel (where it had been in Mercury) to the outside. The contractor was authorized to acquire several long-lead-time procurement items under an amendment to the basic Mercury contract, but Space Task Group limited company expenditures to $2.5 million. The McDonnell project team initially included 30 to 40 engineers. 1961 May 8 - . LV Family: Titan. Launch Vehicle: Titan II. Martin briefed NASA on the Titan II weapon system. - . Nation: USA. Related Persons: Gilruth, Seamans. Spacecraft: Gemini, Mercury Mark I.
Martin Company personnel briefed NASA officials in Washington, D.C., on the Titan II weapon system. Albert C. Hall of Martin had contacted NASA's Associate Administrator, Robert C. Seamans, Jr., on April 7 to propose the Titan II as a launch vehicle for a lunar landing program. Although skeptical, Seamans nevertheless arranged for a more formal presentation. Abe Silverstein, NASA Director, Office of Space Flight Programs, was sufficiently impressed by the Martin briefing to ask Director Robert R. Gilruth and Space Task Group to study possible Titan II uses. Silverstein shortly informed Seamans of the possibility of using the Titan II to launch a scaled-up Mercury spacecraft. 1961 July - . LV Family: Titan. Launch Vehicle: Titan II. Martin proposal for a Titan-boosted Mercury vehicle. - . Nation: USA. Spacecraft Bus: Mercury. Spacecraft: Mercury Mark I.
James L. Decker of Martin Company submitted a proposal for a Titan-boosted Mercury vehicle. A Mercury-Titan program, expected to span an 18-month flight schedule, would benefit from the Air Force's booster development and test of the ballistic missile system and the considerable design and test that the Air Force had expended in the Dyna-Soar program to adapt the vehicle to manned spaceflight. The Titan, with its sea-level rating of 430,000 pounds of thrust in the first stage and 100,000 pounds in the second stage, was capable of lifting significantly heavier spacecraft payloads than the Mercury-Atlas. Its hypergolic propulsion system, using storable liquid propellants, was a much simpler system than the cryogenic propellant system in Atlas. A highly reliable booster could be provided, employing complete redundancy in the flight control systems in the form of a three-axis reference system, autopilot, servo, electrical, and hydraulic systems. The short time he proposed would depend on the availability of pad 19 at Cape Canaveral, planned for conversion to the Titan II configuration. Pad 19, unlike the other three Titan I pads, had been intended for space applications and was better designed for required prelaunch test programs. 1961 July 27-28 - . Advanced Mercury concepts - . Nation: USA. Flight: Mercury MA-10, Mercury MA-11, Mercury MA-12. Spacecraft: Gemini, Mercury Mark I. After the 2-man space concept (later designated Project Gemini) was introduced in May 1961, a briefing between McDonnell and NASA personnel was held on the matter. As a result of this meeting, space flight design effort was concentrated on the 18-orbit 1-man Mercury and on a 2-man spacecraft capable of advanced missions. Representatives of NASA and McDonnell met to decide what course McDonnell's work on the advanced Mercury should take. - . Nation: USA. Spacecraft: Gemini, Mercury Mark I. Representatives of NASA and McDonnell met to decide what course McDonnell's work on the advanced Mercury should take. The result: McDonnell was to concentrate all its efforts on two versions of the advanced spacecraft. The first required minimum changes; it was to be capable of sustaining one man in space for 18 orbits. The second, a two-man version capable of advanced missions, would require more radical modifications. 1963 March 5 - . Study on the ejection of an instrument package from an orbiting Mercury spacecraft. - . Nation: USA. Spacecraft Bus: Mercury. Spacecraft: Mercury Mark I.
NASA Headquarters published a study on the ejection of an instrument package from an orbiting spacecraft. By properly selecting the ejection parameters, the package could be positioned to facilitate various observation experiments. From this experiment, if successful, the observation acuity, both visual and electrical, could be determined; this data would assist the rendezvous portion of the Gemini flights. 1963 April 22 - . Air lock for the Mercury spacecraft - . Nation: USA. Spacecraft Bus: Mercury. Spacecraft: Mercury Mark I. The Bendix Corporation reported to the Manned Spacecraft Center that it had completed the design and fabrication of an air lock for the Mercury spacecraft. This component was designed to collect micrometeorites during orbital flight. Actually the air lock could accommodate a wide variety of experiments, such as ejecting objects into space and into reentry trajectories, and exposing objects to a space environment for observation and retrieval for later study. Because of the modular construction, the air lock could be adapted to the Gemini and Apollo spacecraft. 1963 June 12 - . Webb rules out Mercury MA-10 shot - . Nation: USA. Related Persons: Webb. Flight: Mercury MA-10. Spacecraft: Mercury, Mercury Mark I.
Testifying before the Senate Space Committee, James E. Webb, the NASA Administrator, said: 'There will be no further Mercury shots . . .' He felt that the manned space flight energies and personnel should focus on the Gemini and Apollo programs. Thus, after a period of 4 years, 8 months, and 1 week, Project Mercury, America's first manned space flight program, came to a close.